Corn is the preferred crop to plant in rotation after alfalfa, due to its nitrogen contributions. In addition, volunteer alfalfa is easier to control with corn herbicides, including dicamba. However, there are times when planting corn after a winterkilled, injured or spring terminated alfalfa stand would be so delayed that planting corn would not be recommended. With soybeans later optimum planting date, there would be enough time to assess alfalfa stands and harvest any remaining forage before terminating the stand. Unfortunately, most herbicide options in soybean only suppress volunteer alfalfa and reduce competition, so effective control is difficult. Dicamba-, 2,4-D- and glufosinate-tolerant soybean offer herbicide alternatives for controlling volunteer alfalfa in soybean. In 2017, we demonstrated that most soybean herbicides only suppressed alfalfa competition by 70%. However, using dicamba in a one- or two-pass system improved volunteer alfalfa control to 90-94%, respectively. In 2018, we evaluated dicamba, 2,4-D and glufosinate herbicide systems for controlling glyphosate-tolerant volunteer alfalfa. These systems provided 92-99% control, demonstrating that these soybean technologies offer effective herbicide choices for control of volunteer glyphosate-tolerant alfalfa in soybean. All dicamba (Fexapan), 2,4-D (Enlist One or Enlist Duo) and glufosinate (Liberty) systems provided excellent control of volunteer glyphosate-tolerant alfalfa in this study, 92-99%. PRE sulfentrazone + cloransulam-methyl (Sonic) only suppressed the volunteer alfalfa (24% control). When followed by POST fomesafen + glyphosate (Flexstar GT), control improved (58% control). However, when followed by POST Enlist Duo, 99% control was achieved. PRE Liberty, Enlist Duo (Fig. 1; treatments 3 and 4) or Fexapan (treatment 10) programs gave 82-94% control by June 19. Sequential POST programs with Liberty, Enlist One, Enlist Duo or Fexapan increased control to 92-99% by mid-July. 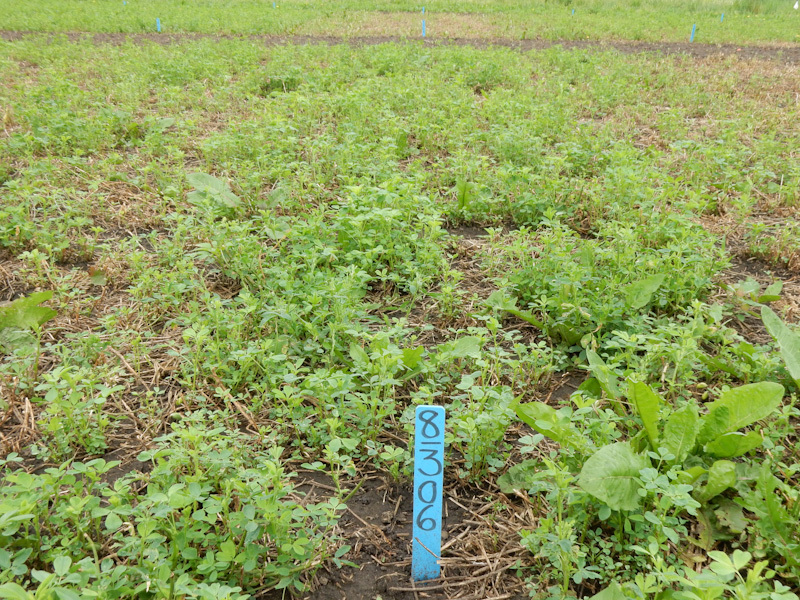 Two-pass POST programs were effective in controlling volunteer alfalfa, but early season alfalfa competition delayed canopy closure. Control reached 98-99% after the second POST application. Established and seedling dandelion control was 96-99% with all dicamba, 2,4-D and glufosinate systems. 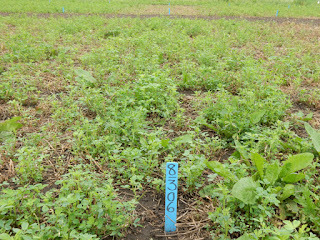 glyphosate-tolerant alfalfa in no-till soybean at Rochester, MN in 2018. To see the full report, visit Control of glyphosate-tolerant alfalfa in no-till Roundup Ready 2 Xtend and Enlist E3 soybean.